After spending months and months building the foundation of my financial knowledge, the desire to get into the action has inevitably been haunting my dreams. With only a small amount of capital, how is one supposed to overcome the stifling restriction of transaction fees? If you can only swing a 200 dollar line, and your round trip commission on trading a stock is $20 dollars, you are already down 10% before the stock even has a chance to move. The answer to this dilemma is the foreign exchange market. The forex brokers forgo a transaction fee, and rely instead solely on the bid-ask spread to profit from our transactions. With fierce competition among all the brokers, the bid-ask spreads are often tight, increasing the attractiveness of this market for the small retail trader. The first place every forex beginner should start is at babypips.com, and in particular, their School of Pipsology. Sure, the humor is a little campy, but the information that is presented in the free curriculum is by far the most comprehensive of any resource I have seen. You will receive a primer in technical analysis, fundamental analysis, as well as trader psychology and risk management rules to live by. Start here first! 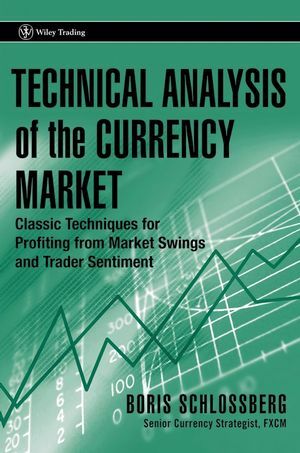 Next, if you have a penchant for technical analysis, Boris Schlossberg’s Technical Analysis of the Currency Market is a book that belongs on your shelf. He covers many basic indicators and oscillators, as well as provides an insight into the peculiarities of these tools when applied to the foreign exchange markets. At the end of the book, he also outlines several technical trading methodologies that build upon the foundation he lays earlier in the book. This is an excellent place to begin learning how to apply technical analysis to the currency markets in an effective way. If you are interested in understanding the fundamental aspects of the currency market (you ought to have a little interest, right? ), I don’t think you could do much better than picking up a copy of Currency Trading for Dummies, by Mark Galant and Brian Dolan. The “Dummies” title is certainly a misnomer in this case- the book gives a very thorough discussion of basic economics, monetary policy, and the characteristics of the major currency pairs. This is a great book for beginners, but slightly more advanced than the topics covered at the School of Pipsology, so I would save this one to read until after you have graduated from babypips.com. If your interest in forex is still alive and well after wading through these resources, I would recommend reading Kathy Lien’s Little Book of Currency Trading. Kathy Lien is one of the brightest minds in the forex world, and it pays to listen to what she has to say. This book is not as dense as the others, but still offers many great insights (if you are looking for a much deeper work, try her 2008 offering, Day Trading and Swing Trading the Currency Market: Technical and Fundamental Strategies to Profit from Market Moves). She will show you her basic trading methodologies, including a Bollinger Band setup and a news trading system, as well as outline her daily routine. I found this book a pleasurable and informative read. These are the resources I have found most beneficial when building a solid foundation of forex knowledge. I hope some of these options are knew to you and will improve your understanding of the currency markets.